On March 1st, spring sun warmed the 80 protestors gathered outside Sheffield Town Hall to say "No to G4S managing asylum housing". We were a mixed bunch: asylum seekers and refugees from all over the world; asylum rights campaigners from all over Yorkshire and the Midlands; trade unionists opposed to the privatisation of public services; campaigners for migrant women's rights, activists from Palestine (already familiar with G4S for their role in backing the Israeli security forces). 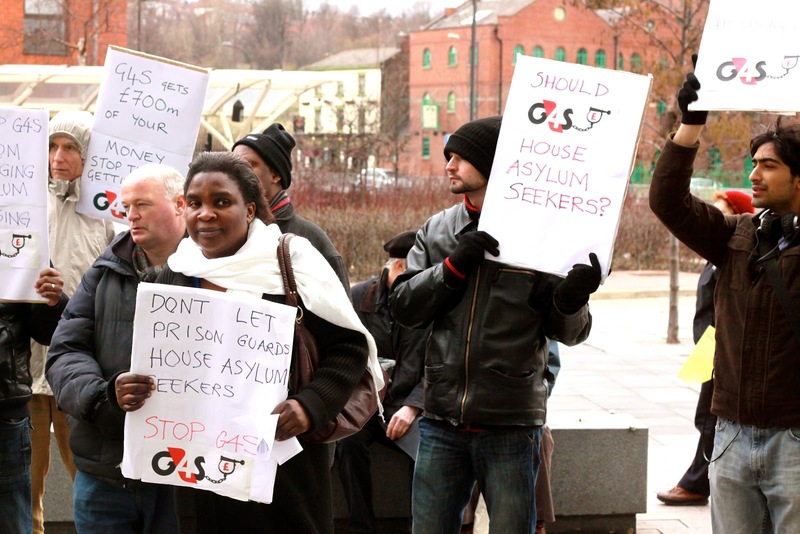 This was the second regional demonstration held in Sheffield against G4S prison guards being given public money to manage the housing of asylum seekers. Passers-by were mostly keen to take leaflets: there's a lot of understanding in Sheffield about who asylum seekers are and why they come here; there's even more understanding that the privatisation of public services benefits nobody except big corporations like G4S. Some people stopped to listen to the speakers and share their own stories of reduced wages and impossible jobs due to privatisation. A statement was read out from Mafungasei Maikokera, a Zimbabwean refugee who had been charged with assault on G4S! Of course, the charges were dropped and the actual violence came from G4S: "when G4S are at it, it is like a boxing match" she told us. Apart from a couple of police (one of whom quietly voiced his concerns that G4S were trying to privatise the police force) we stewarded ourselves and marched to the UK Borders Agency where we held another rally in full view - and earshot - of the workers there (some of them supporters of our campaign). Everybody who wanted to speak got a chance: from a few words of support from people who had travelled from other towns and cities to rousing stuff from SYMAAG's John Grayson, ending with "brothers and sisters, we can beat them!" 6 days after the contract between UKBA and G4S was due to be signed, it is still blank. Every enquiry to UKBA about why this is the case receives a different answer. But the fact remains, G4S and UKBA were mistaken to think that nobody cares about asylum seekers' housing or privatisation.